The largest country in South America and the biggest Portuguese-speaking nation in the world, Brazil remains best known for its soccer tradition and annual Carnaval. Most visitors on holiday in Brazil come for the country's outstanding beaches, music, wildlife, and diverse neighborhoods, each one boasting its own distinct character, atmosphere, and way of life. A tour of Brazil reveals a vast land of great natural and human diversity, from its sprawling rainforest wildernesses to its busy urban centers. There are plenty of things to do in Brazil, from basking on its coastline to chasing the samba scene, or catching a picturesque sunset from one of the country's lush mountaintops. State of Rio de Janeiro: Known for its exuberant annual carnival, this tropical state boasts a sweeping coastline dotted with sandy beaches and turquoise lagoons, as well as a lush mountainous interior perfect for climbing and hiking trips. State of Rio Grande do Sul: The country's southernmost state, Rio Grande do Sul houses picturesque river canyons and villages, as well as wine estates and cattle ranches to match those in Argentina. State of Parana: Miles of pristine beaches, verdant rainforests, and a cosmopolitan capital await you on a tour of Parana State, best known as the home of the magnificent Iguazu Falls. State of Minas Gerais: Known for its abundant mineral springs, this state possesses colonial relics, interesting museums, and a vibrant cultural scene, renowned especially for its music and cuisine. State of Pernambuco: A welcome addition to any Brazil itinerary, Pernambuco offers travelers a colorful culture, plenty of historic sights, and a dynamic capital city, plus tropical islands with picture-postcard beaches and exquisite dive sites. State of Bahia: The state of Bahia provides plenty to boost tourism in Brazil, enchanting visitors with its national parks, African cultural influences, picturesque sandy coast, and, of course, Salvador, its vivacious colonial capital. Sao Paulo: Although often overlooked on a tour of Brazil, the vast city of Sao Paulo supplies travelers with endless activities, boasting verdant parks and renowned museums, as well as shops, bars, and restaurants galore. Curitiba: Known for its innovative urban planning and a plethora of green spaces, Curitiba offers a pleasant base for exploring Iguazu Falls and the rest of the region. Salvador: Vibrant and energetic, Salvador is the nucleus of Brazil's Afro-influenced culture, known for its festivals, cuisine, and jewels of colonial architecture. Foz do Iguacu: As the home of the spectacular Iguazu Falls and the surrounding national park, the city of Foz do Iguacu remains one of the most popular destinations on a Brazil holiday. Fortaleza: Fortaleza's booming beaches, landmark colonial architecture, and party reputation attract local and foreign travelers alike. Brasilia: Venture to Brasilia, Brazil's capital completed in 1960, to discover its World Heritage-listed urban planning and futuristic architecture. Rio de Janeiro: Housing many of the top tourist attractions in Brazil, the sprawling city of Rio de Janeiro captivates with its dramatic landscapes, popular beaches, and a constant effervescent atmosphere. Corcovado Christ the Redeemer: Perched atop a 710 m (2,330 ft) tall mountain, Rio's most recognizable landmark overlooks the city, offering expansive panoramic views. 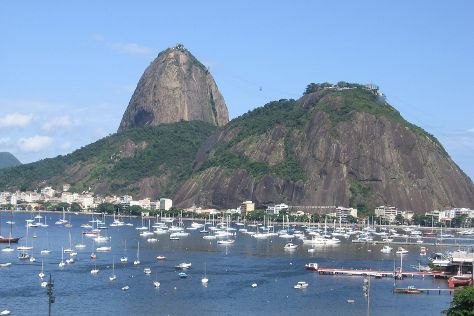 Sugarloaf Mountain: A cable car ride to the top of this mountain, which dominates the city harbor and offers postcard-like views, remains one of the most popular things to do in Brazil. Iguazu Falls: Hundreds of thunderous cascades make up Iguazu Falls, one of the most visited tourist attractions in Brazil, enticing travelers with their dramatic scenery and unbridled power. Ibirapuera Park: An oasis of greenery in the sprawling metropolis of Sao Paulo, this park boasts recreational areas, peaceful walking trails, and renowned museums. Black Lake: Surrounded by pine trees and hydrangeas, the artificial Black Lake remains a prime leisure spot in Gramado--perfect for a picnic, a swan-boat ride, or a tranquil walk. Parque das Aves: This spacious bird rescue park and conservation project houses over 800 species of feathered friends in a lush forest setting, offering both children and adults up-close encounters with tropical avian life. Mini Mundo: A railway ride or walk through Mini Mundo will take you on a journey across the world, thanks to hundreds of miniature models of major Brazilian and international tourist attractions. Jardim Botanico de Curitiba: A major tourist attraction in Curitiba, this French-style botanical garden features rare tropical plants and verdant forest paths interspersed with fountains, ponds, and sculptures. Jardim Botânico do Rio de Janeiro: Nestled in the foothills of Corcovado, this UNESCO Biosphere Reserve houses a plethora of endangered tropical trees and flowers, as well as colorful bird species. Paulista Avenue: Meandering along one of Sao Paulo's major thoroughfares you'll encounter museums, cultural centers, banking headquarters, and an array of shopping opportunities. Because of the country's vast size and diversity, a family vacation in Brazil offers plenty for children to see and do, leaving them with many memorable experiences. Rio and Bahia in particular offer plenty of recreational activities, kid-oriented attractions, and fun in the sun. Incorporate some nature into your Brazil itinerary with Foz do Iguacu, an all-time classic destination that provides access to the famous cascades and rainforest adventures. For engaging cultural elements, head to Minas Gerais, with picturesque, family-friendly villages and historic sights. Southern Brazil, with its gaucho ranches and resort towns, can also be a suitable option for a holiday with children. Besides the abundant beaches, Brazil is home to numerous water and amusement parks, especially near popular resorts and waterfront destinations. Some of the choices for fun family outings include Beto Carrero World in Santa Catarina, or Beach Park, one of the largest water parks in the country. Depending on your children's interests, you can opt for visits to the PUCRS Science and Technology Museum, Football Museum, or Paleontological Research Center and Dinosaur Museum. Animal- and nature-lovers have plenty of things to do in Brazil, from visits to aquariums to adventures in nature reserves and zoos, including Zoo Pomerode, Parque das Aves, and Tamar Project. Brazil is welcoming to families with children, with numerous attractions catering to kids and babysitting services in many accommodations. Although small children can stay for free in most hotels, always book all lodgings in advance, to ensure you'll have enough beds or interconnected rooms if you have a larger family. You may want to rent a car if your tour of Brazil includes multiple destinations, as long bus rides across the country's vast distances can be tiring. Always bring your own car seat if renting a vehicle, as most companies don't have them readily available. You'll find baby food, diapers, and plenty of affordable restaurants with family meals on your Brazil holiday. You most likely won't need shots or anti-malarial precautions unless touring the Amazon; however, play it safe and check in advance which parts of the country require vaccinations. No matter where you go, bring plenty of mosquito repellent. As one of the world's largest countries and a melting pot of cultures, Brazil boasts diverse regional culinary styles. The northeastern states such as Bahia exhibit African and indigenous influences in their cuisines, employing cassava root and shrimp in many dishes, while beef from southern Brazil's cattle farms makes barbecue a favorite in that region. Meanwhile, in the lush, verdant north, freshwater fish often takes pride of place in local dishes. Fuel your tour of Brazil with some of the many meals made with rice and beans, such as “feijoada,” a stew with beans, beef, and pork that most consider the national dish. Papayas, mangoes, and other exotic fruits are often eaten as dessert in Brazil, as well as a variety of chocolate, coconut, and milk-based cakes and puddings. Besides coffee, the national beverage of Brazil, popular drinks include sugarcane liquor and guarana. You'll find plenty of shopping opportunities on your Brazil holiday, especially in bigger cities. San Paulo boasts a variety of large, glitzy shopping malls, rivaling those of the U.S. and other Western countries, while you'll find colorful flea markets, food stalls, and clothing boutiques in Rio. Head to Salvador for antiques and handicrafts, or check out the numerous jewelry stores of Minas Gerais. Manaus is famous for Amazonian souvenirs, locally sourced products, and tech gadgets. ●	More than 180 languages are spoken in Brazil. ●	Brazil's name derives from "Terra do Brasil," meaning "Land of Brazil wood." ●	Brazil is home to the Amazon river and rainforest, one of the most biodiverse places on Earth. ●	Football remains the favorite sport and pastime of Brazil, birthplace of Pele. Although tourist-related crime is not widespread in Brazil, you shouldn't flash your wealth or carry visible things of value in public, especially in large cities where pickpocketing is more common. On the other hand, you should never venture into a favela, or slum, without a local guide. You'll encounter many locals with knowledge of English when touring Brazil, but do try to learn a couple of useful phrases in Portuguese. Don't attempt to speak Spanish with the locals, who may perceive this as ignorant--plus, the two languages are very different. Avoid conversation topics related to politics and religion, as well as making the "OK" sign with your hand, which Brazilians consider vulgar. Brazil has a well-deserved reputation for its lively festivities, especially the easter Carnival, celebrated all across the country. Upbeat music, parades, dancing, and lavish costumes fill the streets of most cities during the carnival, with the most famous and visited celebration in Rio de Janiero each year. Amazonas hosts the second-largest yearly festivity, the Parintins Folklore Festival in June, a three-day celebration of Amazonian indigenous cultures. Rio also puts on the country's most exuberant New Year's Eve party at Copacabana Beach. The country observes numerous other carnivals and holidays throughout the year, so depending on the time of your visit, you can add a vibrant festivity to your Brazil itinerary. Friendly and direct, Brazilians often greet friends with a air-kiss on the cheek, or in the case of both participants being male, with a half-handshake, half-hug. It's not common to see two men kiss. When meeting people for the first time on your Brazil vacation, you can't go wrong with a handshake, but if you're unsure of what to do, just follow the other person's lead. Depending on the region, you'll find that people sometimes kiss once, twice, or even three times when greeting each other. To help things go smoothly on your tour of Brazil, try to learn a couple of basic phrases in Portuguese, such as “ola” (hello), “oi” (hi), and “tchau” (bye). To thank someone, you should say “obrigado” or “obrigada” depending on your gender, while “de nada” means “you’re welcome” in Portuguese. The climate in Brazil varies substantially from region to region, depending on the altitude and proximity to the equator. While the southern parts of the country and mountainous areas experience a temperate climate, with temperatures ranging from 13-22 C (55-72 F), the northern and coastal areas enjoy constant warm weather, ranging from arid in the interior to very humid on the coasts and the Amazon basin. If you're touring Brazil in summer, from December to April, bring light clothing, while some waterproof items may be necessary in the rainy season, lasting from April to June in the north and from October to January in Rio. The southern parts can get quite chilly from June to September and may require warm clothing; if you’re looking for a balmy Brazil holiday, choose the summer to travel here, or plan your trip in the northeast, where average temperatures never dip below 25 C (77 F). Transportation options in Brazil vary regionally, especially the passenger railway services, operated by an array of private companies. With a low car-ownership rate, many unpaved roads, and frequent speeding, driving across the country can be hazardous, especially at night. Fortunately, domestic air travel presents an affordable way to traverse long-distances on your tour of Brazil. You should be able to get around larger cities relatively easy and affordably, thanks to quality local bus services and taxis, and in some cases metro lines. While not compulsory, tipping is expected in most restaurants, bars, and cafes in Brazil. Many places will tack on an optional 10 percent "service fee," which people almost always pay unless the service was exceptionally bad. It's not customary to tip taxi drivers, but you can round up the price to avoid searching for coins. During your Brazil holiday, tour guides, bellhops, and hotel housekeeping staff may expect a small tip for their services.